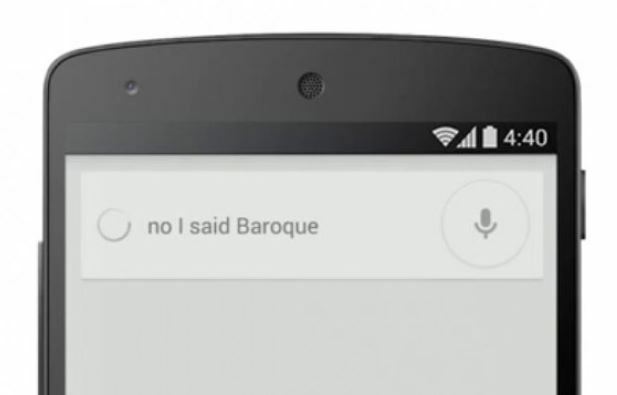 Google us working on the advance of its voice command search technology. Google has added a plenty of new features along with inclusion of new languages. Hence from now on even if the language set in your computer is not English you can still use voice commands if your language is enlisted in. Google Now is undoubtedly a great service but since it depends on speech extraction it is entailed to be disturbed by noise or wrong pronunciation. Besides this there are lot more problems that arisen in Ok Google. When you are using OK Google you cannot do any side function like turning of mobile data connection when WiFi is available. But at present the most common problem was the misinterpretation of Voice commands. It’s a good thing that Google found a convincing solution by letting users clarify their commands again and again. For example you gave a command,” Ok Google tell me who is xyz” and it interpreted something “abc” instead of xyz, then you can clarify again saying “No, I said xyz”. So this contextual awareness feature has been greatly improved. The updated Google Search supports these voice-based corrections in both the Android and iOS versions of the app. The control of media by Google voice command is also incorporated in the “we should be able to do it” category. This feature is available for limited accounts as they are in testing phase. You can always check if your account supports it. The refining process is a great update and we hope to see other supports roll up soon.